Lecture: "China's Pursuit of 'Soft Power' in the Era of Xi Jinping and Donald Trump"
The Chinese government spends well over $10 billion a year on soft power projection, but has not been as successful as the U.S., which spends very little. Given the steep decline in favorability ratings for the U.S. around the world under the Trump administration, has China been able to close the soft power gap? I will suggest that, given the methodologies for measuring soft power, liberal democracies will always rank at the top of soft power indices. Moreover, in China’s hierarchy of values, influencing the behavior of other countries – and punishing them for “anti-China policies” – is more important than soft power, which has been sacrificed when it conflicts with more important values. In addition, Chinese soft power is focused more on the domestic audience since political and social stability at home are China’s paramount values. This in turn requires state control of civil society. American soft power has been most successful when it is separated from government – e.g., Hollywood films – while the pursuit of Chinese soft power has been inseparable from government initiatives. Stanley Rosen is a professor of political science at USC specializing in Chinese politics and society. 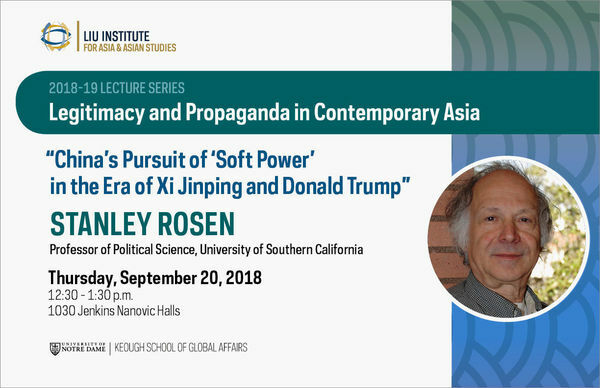 This lecture is part of the Liu Institute’s 2018-19 "Legitimacy and Propaganda in Contemporary Asia" speaker series.